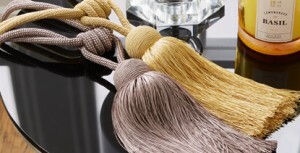 We are delighted to bring you our latest range of tiebacks called Orb. This collection is made up of 12 of our most popular colour ways, from calming duck egg to rich mocha. Its design is simple and sleek, with a silky texture enhanced by its shimmering appearance. It is a medium sized tieback with a traditional look, which makes it the perfect accessory for any curtains or window display. This range is all about everyday elegance, which is why it is a great match for our Symphony fabric collection. Symphony is all about decadence, with its rich colours and shimmering, silky textures, combining this with the Orb tieback would be the ultimate statement. The smooth lines of the tiebacks blend well in to the fine floral patterns and bold stripes of the fabric and the colours are the perfect compliment for one another.